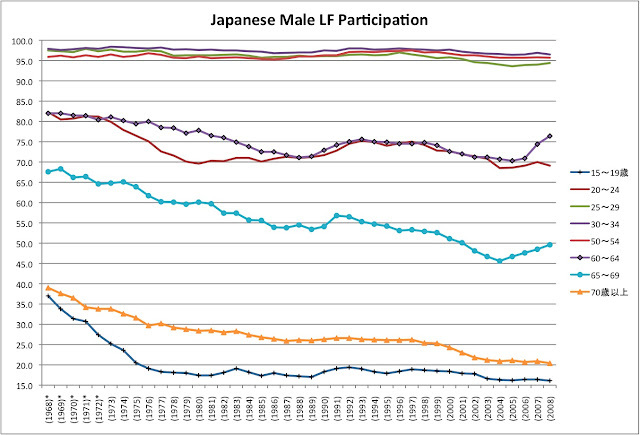 In response to Joyce Gelb's query on the NBR Japan discussion forum, women's LF participation has evolved quite markedly in the past 20 years. As she notes, this does not mean they face equal opportunities -- and it says nothing about whether they are full-time regular hires or part-time or contract workers. But it does reflect very significant changes in behavior among younger women. 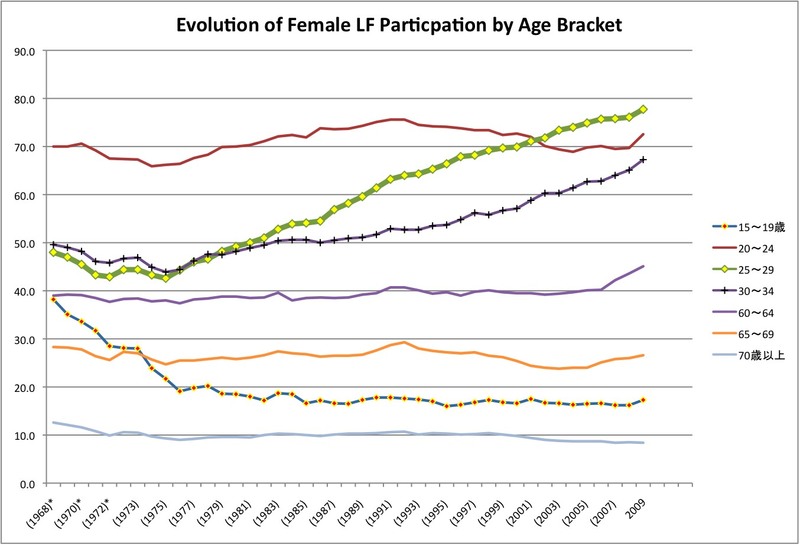 Now the participation rate for women in the 20-24 year old bracket is flat, but during this period the proportion of women pursuing post-high-school education (and among them, the proportion choosing a 4-year over a 2-year institution) has risen markedly. That pulls the average down. 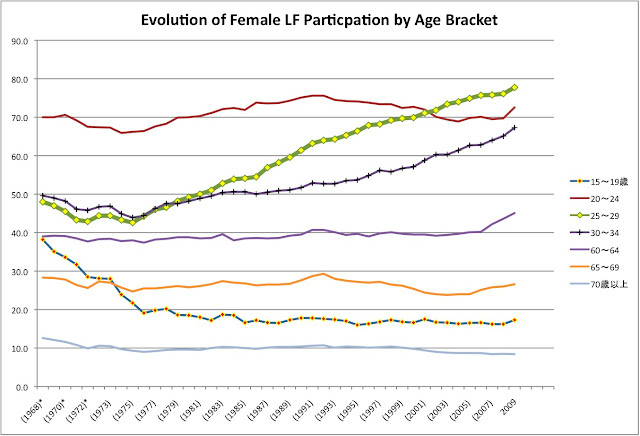 In the data the participation rate of the 25-29 year old bracket is now the highest. That is even more stark if we compare it with 1973 -- I deleted most of the age brackets for visual clarity -- when the 25-29 participation rate was lower than any age bracket other than the one that included high school students, and women age 60 and above. 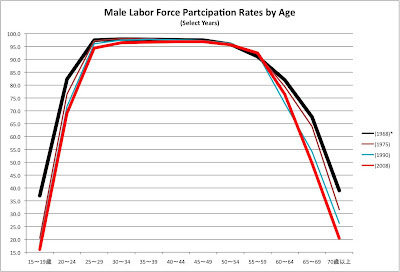 Note too that the participation rate of the 30-34 year old bracket is now rising at about the same rate -- more and more of them continue to work. A few classes ago we were talking about how the age women marry will largely determine the number of children they have over a lifespan. 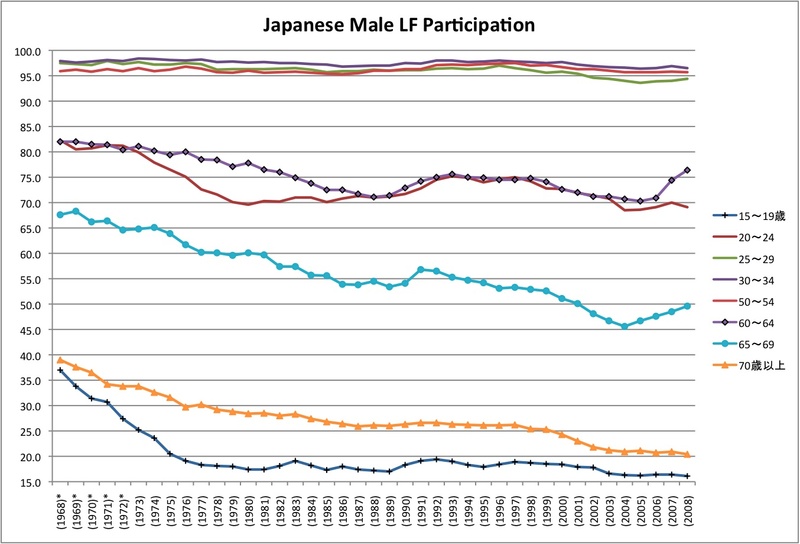 This posting examines how the women of Japan have become much more involved in the labor force over the past two decades. This has resulted in women marrying later, producing fewer children, and contributed to low population growth. Japan is currently experiencing deflation where prices are falling due to low quantities demanded. This is directly related to their population. 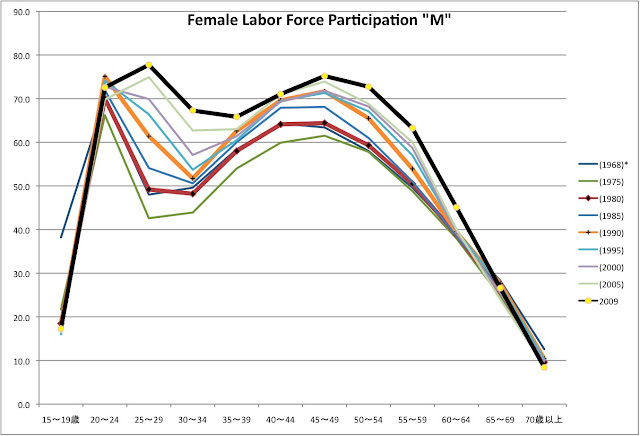 In general, involving more women in the labor force is a great method to help develop an economy. However, since Japan is an export driven economy where a strong currency works against you it might be in their best interest for less women to be a part of the labor force. That would probably lead to earlier marriages and more children per lifespan, which would boost population growth and future quantities demanded. We'll have to think about whether there is a link between demographics and deflation/inflation; yes in the case of real estate, especially rural real estate, but otherwise? After reading the article on GDP, it now does not surprise me how open Japan is with its government data. It seems that information is compiled and released so "unprofessionally" and slowly, as you mention, that I begin to wonder how much the relaxed laws on information flow even matter. I know the United States charges for the release of much of its information. But for a company or individual who really needs great and timely data, is it not better for there to be a surcharge, at times fairly minimal? That is an interesting connection to make between demographic information (marriage and children) and the effect on GDP. The most obvious connection to make is to population numbers, but can you really extrapolate demographics to inflation/deflation? Do we see similar relationships in other economies? Like ones that are not currently experiencing a shrinking population? I don't have data on age of marriage, the appropriate metric might be the percentage of a birth cohort married by age x. For fertility, the key number would be the age at which the first child is born. Is participation in the LF in tension with marriage and fertility? You've given your hypothesis but it then is important to look at other data. Challenge: see if you can find it! Now you will need to spell out the logic of population growth and deflation, e.g. is population growth key or income growth key? Finally, is Japan's economy really export-led? Look at X/Y (exports to GDP) and net trade to GDP (X-M)/Y. Is trade important in the aggregate? are there frequent periods when exports or net exports "outgrow" GDP and hence would appear to "lead" growth?